Latin Dance Tea at Club 64! Join us for a friendly and intimate setting of group dance classes and dance tea / social held on Saturday afternoons at Club 64 in Chilliwack. Learn to dance Salsa, a popular Latin American dance known for its flirtatious moves and spins to exhilarating Cuban rhythms. Other Latin dances such as Merengue, ChaChaCha, Rumba, Bachata, or Jive may be introduced on demand over time, starting with the easiest: the Merengue. Following the 1.5 hour lesson, stay another hour for coffee, tea, or soda and pastries provided by the Royal Cafe (included* in 5-week season fee), and feel free to socialize and practice your dance moves. Duration: ongoing - weekly (5-week segments). Cost: $100 for 5 consecutive weekly lessons, 1 non-alcoholic beverage and 1 pastry per session. Pay at least 5 days prior to first session to allow for advance pastry order! Drop-in: $20 (*pastry not included with drop-in). Please wear light clothing as you will work a sweat. A small towel may come handy. Shoes should not have a soft rubber sole that would hinder you from swiveling while trying to turn. Dance shoes with suede leather soles are recommended. My mission is to ensure everybody in the class is learning something new and/or improving their dance skills and have a lot of fun in the process. Our group is relatively small allowing us to build friendships, which again makes it more fun. The venue is a private room within The Wellington Local House and next to the Royal Cafe and can be accessed directly from its Main Street entrance near its free Main Street parking lot. 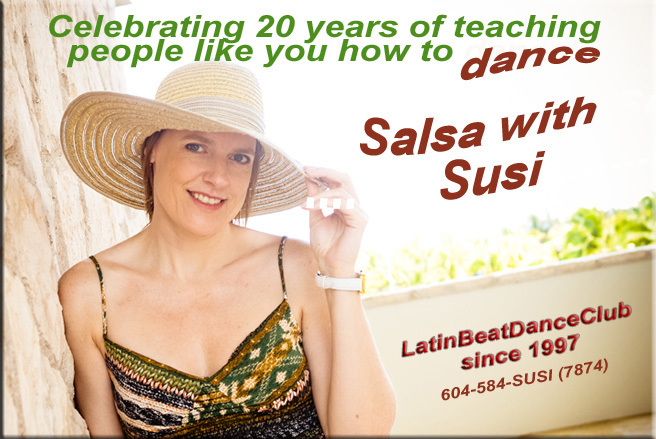 With 20 years of teaching dance within the Lower Mainland, I aim to give my students what they need and when they need it in each class, so students can make requests at any time. So our program is quite flexible - but generally follows a long list of moves I have developed, that can be led and followed with different partners. As a general guide line for each class the first half includes review of basic steps and improvement of technique in footwork, hip - and body movement, review of basic patterns and leading techniques. The second half of the class is dedicated to longer more challenging routines with details on fool-proof leading and following techniques for each pattern change. Students of different levels can choose to learn and use all or just some of the parts of the routine, depending on their level and personal preference. Although you will dance with the same partner for most of the lesson, after a particular pattern has been studied we may do a few quick partner changes in a row to accomplish repetition and fine-tune our leads. For the first season in March 2019, please pay in advance by February 25th, 2019 to ensure we can pre-order you the pastry for the first session. Payments can be made via PayPal link below using your credit card, or via e-transfer. For details required for an e-transfer please call or text me at 604-584-SUSI (7874). After that I recommend you bring the full amount of $100 in cash one week prior to the first lesson of the next season. This will secure your spot in the class, and the pastry which we have to pre-order. E-Transfer: For details required for an e-transfer please call or text me at 604-584-SUSI (7874). Class members usually let me know in advance by text/call if they are planning to come to the first lesson, or after that whenever they are not able to come to a class. To achieve the most benefit to my students I use my discretion to postpone lessons that most of the students cannot attend. Please let me know in advance If you are planning to join the class without a dance partner, so I can try to organize one. If you have any more questions or wish to register, please call me at my cell phone at 604-584-7874.